Meet one of the most well-known picklers in the world- Mark Friedenberg! The following excerpts are from the preface of Mark’s book, The Official Pickleball Handbook, 2nd edition. PBC: Mark is a major player in the pickleball world. Here are some of his accomplishments. 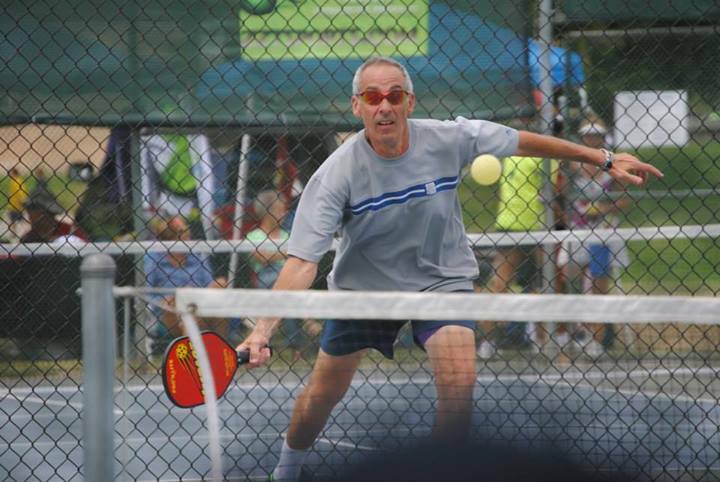 MF: 5.0 ranking; is a National Doubles Champion; one of the top ranked pickleball players in the United States. In February 2005, I established the new USAPA and its Board of Directors. 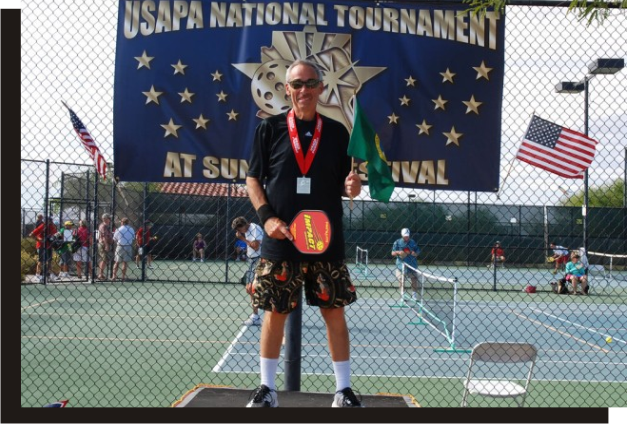 Under me and the USAPA Board of Directors, the USAPA has developed a fantastic and highly dynamic website that is viewed by 2000 people per day, is the governing body for the pickleball rules, has a membership base of 4000, provides player rankings and ratings, training and has over 400 ambassadors throughout North America. I am also an author of “The Official Pickleball Handbook” and run an instructional pickleball website named Winning Pickleball. PBC: Mark started as a competitive table tennis player. MF: Who’s Harry? Well, when I was thirteen years old (when the dinosaurs roamed the earth) I played table tennis several days a week at a nearby park. I thought that I was really good! Then I met Harry. Here was a sixty-year-old man who really knew the game of table tennis. He gave me some tough lessons on how to play the game. Harry taught me how to create tremendous spins on the ball and how to return slams that backed me 3-5 feet away from the table. The challenge of returning slams and creating various spins on the ball made this game so exciting that I continued to play table tennis in tournament play throughout my college years. PBC: Some of Mark’s favorite things about pickleball. MF: The challenge of returning an overhead smash at my feet back into my opponent’s court. The sight of my opponents cringing as my spin shot forces their returns to drop into the net. The dodging of a “bullet” as my opponent’s drive shot just misses me and flies out of bounds. The smashing volleys that go back and forth over the net several times. The enjoyment of watching my opponent gasping for breath and in a pool of sweat as he chases down my shots that take him from one side of the court to the other. This game is filled with fun and excitement – I love this game! Over the years I have played in hundreds of tournaments. Some of my medals are important to me but most are insignificant. They all eventually go into boxes. In tournaments we all put our “game face” on and work hard to win. But afterwards, we celebrate long-lasting and newly formed friendships and partnerships. We also celebrate the fun times we had. To me, those are the memories we take away from the game. PBC: Mark’s “secret sauce” is in his book! MF: My book is designed for all levels of play, from the beginner up through the best players in the game. My 2nd Edition is well organized, very entertaining, easy to read, and contains lots more great pictures depicting the basic fundamental skills and more strategies of pickleball to improve your game significantly! I also exposes many of the secrets of the master players. PBC: Mark was the owner of Pro-Lite Sports. MF: I am the previous owner of the Pro-Lite Sports paddle company. I am an educator, teaching at the college level at the US Naval Academy, Annapolis, MD, and Green River Community College, Auburn, WA. I have a BA in Math and an MS in Computer Science. PBC: Mark dreams of pickleball at the Olympic Games. MF: Several years ago, I spoke to a representative of the International Olympic Committee (IOC). My dream was to get pickleball into the Summer Olympics. He said that to get a sport into the Olympics requires this new sport to be played at the highest level in many of the world’s countries. If the Olympics can play Badminton, then they can play pickleball! PBC: Seattle is Mark’s home base. MF: My partner in life, Lela Reed, and I live in Seattle but travel to many tournaments around the country. I have 2 children, both married and living in different parts of Wisconsin. I have three grandchildren. Want to see videos of Mark Friedenberg? Click here!